The Sandy Hook school shooting hoax was, and still is used as a reason, an excuse to take firearms away from us. We need to solidly understand that the shooting story is and always was fiction, and such flimsy fiction as to be easily shot full of holes. A few things came my way recently that relate. I share this fresh-to-me information here. 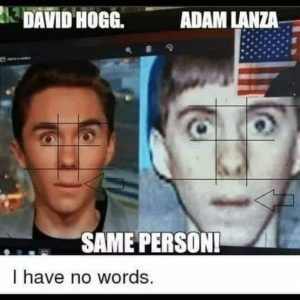 For one, the startling resemblance of the supposed shooter and the “kid” who became a national spokesman for gun control after the staged, fake school shooting in Broward County Florida … yeah, THAT Broward County. A few years older, but the same guy. Are there really so few sold-out actors they have to keep re-using them? Apparently so. I don’t want to re-publish all the details here, but if you wish to refresh your memory, a search of this site will deliver many details surrounding the hoax that happened in Sandy Hook. https://www.bitterrootbugle.com/?s=sandy+hook This link is the same as if you typed “sandy hook” into the “search this site” box in the upper-right-corner of this website. Nickel overview: The school was closed. Multiple organizations were running a school shooting drill. Numerous actors played roles (mostly badly played). The coroner actor chuckled intermittently over what some believe was a mass shooting of school children. Stories shifted and changed in significant ways from one telling to the next. On and on it goes, but I repeat old news I already published. New to me is this 12 minute YouTube video whose producer finds how the silence was purchased of so many people living around the school. Many of us knew they had to have been paid off, but WOW, this is right there in front of us. Not one, two or even a few mortgages went from hundreds of thousands of dollars to zero on Christmas Day – when no title company or recorders office in the USofA would have been open for business. Think about how deep the corruption is, was, to pull that off. But we know that too. The remaining mega-banks are swamp-filthy. Their funds come out of thin air. They eat middle class, good people like popcorn. Moving a few electrons around in the incessant drive to disarm the populace is simply business as usual. Christmas Day – yeah, let’s do it on Christmas Day. That will be funny as heck. The few nobodies who notice can’t do anything about it. Ha ha ha. We’ll see, swamp creatures. There is a new sheriff and posse in town. The show is not over yet. This next video goes over the images we saw over and over and over again on lamestream media. A handful of usable clips from their drill had to serve every presstitute every time they wanted to discuss their gun confiscation centerpiece. This video blows that junk out of the water. Do not let THEM own the dialogue. Any and every time school shootings come up, INTERRUPT. More of those events are staged hoaxes than real. Send them here. Send them to the Internet. The truth is available to those who are interested in truth. Only a large-scale popular movement toward decentralization and self-help can arrest the present tendency toward statism… A really efficient totalitarian state would be one in which the all-powerful executive of political bosses and their army of managers control a population of slaves who do not have to be coerced, because they love their servitude. To make them love it is the task assigned, in present-day totalitarian states, to ministries of propaganda, newspaper editors and schoolteachers.